All of the key questions answered about Webb targeted for the general interest level. What was the Webb called before it was named after James Webb? Who was James E. Webb? How will Webb be better than the Hubble Space Telescope? When will Webb be launched? How will Webb be launched? Why has the Ariane 5 been chosen to launch Webb? Why not change to Space X? Why do we have to go to space at all? Can we not get these data with large telescopes on the ground, using adaptive optics? How long will the Webb mission last? Why is Webb not serviceable like Hubble? How is testing different for Hubble and Webb's mirrors? What did Hubble teach us? Will Webb use gyroscopes for pointing? How big is Webb going to be? Why does the sunshield have five layers rather than one thick one? How will Webb communicate with scientists at Earth? What happens after Webb is launched? How long will it take Webb to reach its orbit? Why does Webb have to go so much farther away from Earth than Hubble? What is the second Lagrange point orbit? How can Webb's primary mirror be six times the size of Hubble's but be less massive? The primary mirror on Webb will be made of beryllium. What is beryllium? How will you protect Webb from the violent forces involved in the Ariane rocket launch? I have read that beryllium is relatively brittle. Will micrometeoroids damage the beryllium mirror? Why is the mirror gold-coated and how much gold is used? Why does Webb have a segmented, unfolding primary mirror? What is Webb's angular resolution, and how will its images compare to Hubble's? Will they be as beautiful? What kind of instruments will Webb have? What kind of detectors will Webb have? What is the operating temperature of the telescope and the instruments? Why is Webb optimized for near- and mid-infrared light? At which wavelengths will Webb observe? How faint can Webb see? What are the main science goals of Webb? Will Webb see planets around other stars? Can Webb observe planets in our own solar system? What will Webb's first targets be? Will Webb contribute to the dark matter research? Will Webb be able to tell us more about the Big Bang? Who are the partners in the Webb project? Who will be able to use Webb and how is this decided? Will I be able to see Webb pictures? Will Webb images look as good as Hubble's? Can I attend Webb's launch? Where will it launch? In Florida? What will the first galaxies that formed after the Big Bang look like? What is redshift and how do you measure it? What is a light-year? And what is a parsec? What is a micrometer? What is a micron? What is an arc-minute? What is an arc-second? How does our atmosphere block infrared radiation from space? How can I find out more about Webb? I'm a professional astronomer - how can I find out more about Webb? The James Webb Space Telescope, also called Webb or JWST, is a large, space-based observatory, optimized for infrared wavelengths, which will complement and extend the discoveries of the Hubble Space Telescope. It will have longer wavelength coverage and greatly improved sensitivity. The longer wavelengths enable Webb to look further back in time to find the first galaxies that formed in the early Universe, and to peer inside dust clouds where stars and planetary systems are forming today. The James Webb Space Telescope was originally called the "Next Generation Space Telescope," or NGST. It was called "Next Generation" because Webb will build on and continue the science exploration started by the Hubble Space Telescope. Discoveries by Hubble and other telescopes have caused a revolution in astronomy and have raised new questions that require a new, different, and more powerful telescope. 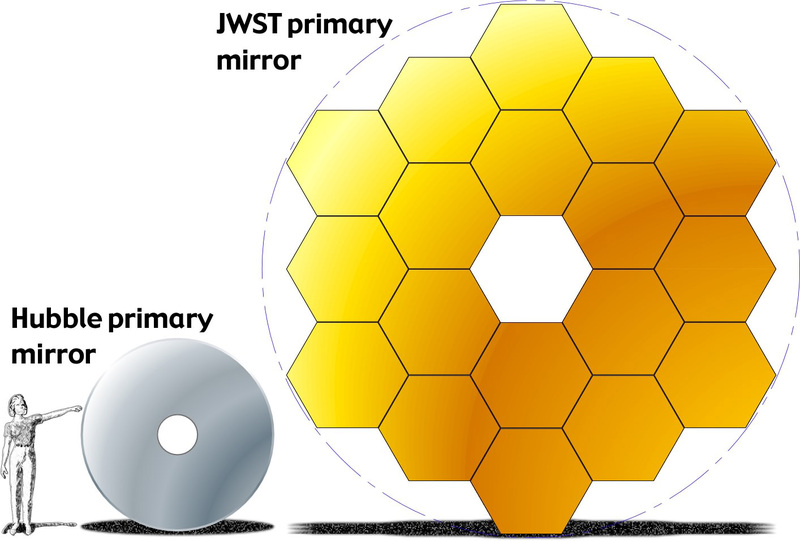 Webb is also a "Next Generation" telescope in an engineering sense, introducing new technologies like the lightweight, deployable primary mirror that will pave the way for future missions. On 10 September 2002, the Next Generation Space Telescope was named in honor of James E. Webb, NASA's second administrator. This space-based observatory is named after James E. Webb (1906- 1992), NASA's second administrator. Webb is best known for leading Apollo, a series of lunar exploration programs that landed the first humans on the Moon. However, he also initiated a vigorous space science program that was responsible for more than 75 launches during his tenure, including America's first interplanetary explorers. For more information, please visit this page on our website. James E. Webb's official NASA biography can be found here. Webb is designed to look deeper into space to see the earliest stars and galaxies that formed in the Universe and to look deep into nearby dust clouds to study the formation of stars and planets. In order to do this, Webb will have a much larger primary mirror than Hubble (2.7 times larger in diameter, or about 6 times larger in area), giving it more light-gathering power. It also will have infrared instruments with longer wavelength coverage and greatly improved sensitivity than Hubble. Finally, Webb will operate much farther from Earth, maintaining its extremely cold operating temperature, stable pointing and higher observing efficiency than with the Earth-orbiting Hubble. Here is a feature that contrasts Webb with Hubble. Webb is planned to launch in 2021. Webb will be launched on an Ariane 5 ECA rocket. The launch vehicle is part of the European contribution to the mission. Additional information may be obtained here. We chose Ariane in the early 2000's for a combination of reliability (it was the only launch vehicle that met NASA's requirements for launching a mission like Webb) and for the value it brings via our international partnership. By "value" we mean that the European Space Agency provides us a launch vehicle and associated services on a no exchange of funds basis. In exchange, NASA guarantees European scientists a fraction of observing time on Webb (roughly 15%). Since architectural realities of Webb and international technology restrictions (plus industrial capabilities and strategic technology interests) meant we couldn't have a spacecraft bus or a sunshield or telescope parts from Europe, we asked for the launch vehicle, launch services and science instruments instead. Another reason not to change launch vehicles midway through a project is because each vehicle has its own environmental characteristics. Rockets are all similar to an extent, but they do have significant differences in their major vibro-acoustic modes. Designing something to encompass any/all environmental specifications is pretty tough, adds cost and mass, and reduces capability. Knowing your launch vehicle early helps you design for it. Also, launch programs (ascent profiles) are specific not only to the vehicle but are even quasi-specific to the day of the year and time of day. This means you need to know not only your launch vehicle but your launch location. Agreements with Ariane have been made to ensure the use of the Ariane 5 for our launch in 2021. The Earth's atmosphere is nearly opaque and glows brightly at most of the infrared wavelengths that Webb will observe, so a cold telescope in space is required. For those wavelengths that are transmitted to the ground, the Earth's atmosphere blurs the images and causes stars to twinkle. Currently, adaptive optics systems can correct for this blurring only over small fields of view near bright stars functioning as reference beacons, allowing access to only a small fraction of the sky. Artificial light beacons created with strong lasers may provide better access to the sky, but the technology to provide a wide field of view is still far in the future. Finding the earliest galaxies will require very low foreground light levels, ultra-sharp images over large areas, and studies at many infrared wavelengths, a combination of observing conditions only available from space. Webb is designed to have a mission lifetime of not less than 5-1/2 years after launch, with the goal of having a lifetime greater than 10 years. The lifetime is ultimately limited by the amount of fuel used for maintaining the orbit, and by proper functioning in orbit of the spacecraft and instruments. Webb will carry fuel for a 10-year lifetime (with margin); the project will perform mission assurance testing of the flight system to guarantee 5 years of scientific operations starting at the end of the commissioning period 6 months after launch. Hubble is in low-Earth orbit, located approximately 375 miles (600 km) away from the Earth, and is therefore readily accessible for servicing. Webb will be operated at the second Sun-Earth Lagrange point, located approximately 1 million miles (1.5 million km) away from the Earth, and will therefore be beyond the reach of any crewed vehicle currently being planned for the next decade. In the early days of the Webb project, studies were conducted to evaluate the benefits, practicality and cost of servicing Webb either by human space flight, by robotic missions, or by some combination such as retrieval to low-Earth orbit. Those studies concluded that the potential benefits of servicing do not offset the increases in mission complexity, mass and cost that would be required to make Webb serviceable, or to conduct the servicing mission itself. First, on Webb, we use completely separate sets of measurement tools and techniques for verification than what we used to guide manufacturing. This avoids one error from the Hubble experience where the same tool used for manufacturing was later used for verification. In technical terms, specifically on Hubble, Perkin-Elmer used the same reflective null corrector to guide primary mirror final figuring and polishing that they later used to vouch for its figure. The reflective null corrector was set up wrong and furthermore was not independently checked for correct setup and thus the mirror ended up with the wrong figure. Even so, Perkin-Elmer used a separate tool--a refractive null corrector--to check focal length of the primary mirror and it could have served as an independent check of mirror figure. In fact the refractive null corrector hinted that something was wrong with mirror's figure, but this was rationalized away in favor of the reflective null corrector data because the reflective one was more precise and provided complete (albeit false) figure information, and the purpose of the focal length check was a focal length check and not a figure check. On Webb, all mirror figures have been verified individually at the mirror level, and figures will again be checked after the telescope is assembled. Secondly, on Webb, we are performing an end-to-end optical test on the whole telescope, which was not done on Hubble. An end-to-end check of the assembled Hubble telescope should have and probably would have revealed the figure flaw in its primary mirror. In more technical terms, the end-to-end test on Webb's telescope involves passing light through the entire assembled telescope using test point sources of light from precision-placed fiber optics and using reflecting mirrors (three auto-collimating flat test mirrors). This will re-check alignment of all the telescope optics assembled together and demonstrate that the individual primary mirror segments can be aligned to each other, and it will re-check the figures of the mirrors. In summary, we use multiple independent testing and cross-checks with pre-defined success criteria that includes end-to-end testing, as well as comprehensive and rigorous external independent expert review as a further check. Gyroscopes are used in combination with star tracker assemblies (STAs) to estimate the orientation of the observatory. In the Webb attitude control design, this estimate is used to slew the observatory from target to target, and maintain pointing on a target prior to fine guide and science operations. Typically, at least three gyroscopes oriented in three different directions are needed to determine the orientation of the observatory (although innovative operational procedures allowed Hubble to get by with just two working gyros plus other sensors prior to its last servicing mission). Like Hubble and many other spacecraft, Webb begins life with a redundant set of working gyros, so multiple gyro failures may be accommodated without loss of scientific capability, but unlike Hubble, Webb employs a very different kind of gyroscope. Hubble uses traditional mechanical gyroscopes, which measure the inertia of a small spinning flywheel to sense angular motion. Mechanical flywheels require moving parts in a fluid medium, and thus are subject to wear over time. Webb uses "Hemispherical Resonator Gyros" or HRGs. Sometimes called "wine glass gyroscopes," HRGs measure the flexing vibration of a bowl-shaped stemmed crystal to sense angular motion. HRGs operate in a vacuum and have no rotating or rubbing parts, so they suffer virtually no wear. Webb houses two HRGs, each internally contains two processors and power supply boards (2 for 1 redundancy) cross strapped to 4 gyros (4 for 3 redundancy). In the current architecture, one HRG is active receiving commands and providing telemetry, while the other HRG is in backup mode. Webb's HRGs and the Fine Guidance Sensor (FGS) instrument work with the final optic in the telescope, called the fine steering mirror (FSM), to stabilize the beam of light coming from the telescope and going into the science instruments. The FSM can tip and tilt a minute amount very quickly to compensate for small motions or "jitter" in the light beam, thus avoiding the need to point the whole observatory extremely precisely on a target. The HRG, in concert with the STAs and the reaction wheels, help stabilize roll about the optical axis. The reaction wheels work in combination with three star trackers and six gyroscopes that provide feedback on where the observatory is pointing and how fast it is turning. This enables coarse pointing sufficient to keep the solar array pointed at the Sun and the high-gain antenna pointed at the Earth. To take images and spectra of astronomical targets (i.e., galaxy, star, planet, etc.) finer pointing is needed. Additional information for finer pointing from the Fine Guidance Sensor in Webb's integrated science instrument module (ISIM) is used to move the telescope's fine steering mirror (FSM) to steady the beam of light coming from the telescope and going into the science instruments. Webb's reaction wheels, star trackers, gyroscopes, Fine Guidance Sensor, and fine steering mirror work together in the observatory's attitude control system (ACS) to precisely point and stare at targets so that the science instruments can see them and see them clearly. The system works much the same way your body uses multiple methods of differing precision -your inner ears and eyes and nervous system and muscles - to catch a baseball in the outfield. The most important size of a telescope is the diameter of the primary mirror, which will be about 6.5 meters (21 feet) for Webb. This is about 2.75 times larger in diameter than Hubble, or about 6 times larger in area. The Webb will have a mass of approximately 6,500 kg, with a weight of 14,300 lbs on Earth (in orbit, everything is weightless), a little more than half the mass of Hubble. The largest structure of Webb will be its sunshade, which must be able to shield the deployed primary mirror and the tower that holds the secondary mirror. The sunshade is approximately the size of a tennis court. Each successive layer of the sunshield is cooler than the one below. The heat radiates out from between the layers, and the vacuum between the layers is a very good insulator. One big thick sunshield would conduct the heat from the bottom to the top more than 5 layers separated by vacuum. The Webb will send science and engineering data to Earth using a high frequency radio transmitter. Large radio antennas that are part of the NASA Deep Space Network will receive the signals and forward them to the Webb Science and Operation Center at the Space Telescope Science Institute in Baltimore, Maryland, USA. In the first hour: Starting at liftoff, the Ariane rocket will provide thrust for a little over 8 minutes. Webb will separate from the Ariane V launch vehicle a half hour after launch and we will deploy the solar array immediately afterward. We will also release several systems that were locked for launch. In the first day: Two hours after launch we will deploy the high gain antenna. Twelve hours after launch there will be the first trajectory correction maneuver by small rocket engines aboard Webb itself. In the first week: The second trajectory correction maneuver will take place at 2.5 days after launch. We will start the sequence of major deployment just after that. The first deployments are the fore and aft sunshield pallets, followed by the release of remaining sub-system launch locks. The next deployment is the telescope in which the telescope and the spacecraft bus move apart from each other by about 2 meters when the deployable tower assembly extends. The full sunshield deployment with unfolding and tensioning of the membranes can then be initiated. At 6 days we deploy the secondary mirror, followed by the side wings of the primary mirror. In the first month: As the telescope cools down in the shade of the deployed sunshield, we will turn on the warm electronics and initialize the flight software. At the end of the first month, we will do the mid-course correction that ensures that Webb will achieve its final orbit around L2. Although the telescope cools to near its operating temperature, the ISIM is warmed with electric heaters to prevent condensation on the instruments as residual water trapped in the materials making up the observatory escapes to the vacuum of space. In the second month: At 33 days after launch we will turn on and operate the Fine Guidance Sensor, then NIRCam and NIRSpec. The first NIRCam image will be of a crowded star field to make sure that light gets through the telescope into the instruments. Since the primary mirror segments will not yet be aligned, the picture will still be out of focus. At 44 days after launch we will begin the process of adjusting the primary mirror segments, first identifying each mirror segment with its image of a star in the camera. We will also focus the secondary mirror. In the third month: From 60 to 90 days after launch we will align the primary mirror segments so that they can work together as a single optical surface. We will also turn on and operate the MIRI. By the end of the third month we will be able to take the first science-quality images. Also by this time, Webb will complete its initial orbit around L2. In the fourth through the sixth month: At about 85 days after launch we will have completed the optimization of the telescope image in the NIRCam. Over the next month and a half we will optimize the image for the other instruments. We will test and calibrate all of the instrument capabilities by observing representative science targets. After six months: Webb will begin its science mission and start to conduct routine science operations. Webb requires a distant orbit for several reasons. Webb will observe primarily the infrared light from faint and very distant objects. Infrared is heat radiation, so all warm things, including telescopes, emit infrared light. To avoid swamping the very faint astronomical signals with radiation from the telescope, the telescope and its instruments must be very cold. Webb's operating temperature is less than 50 degrees above absolute zero: 50 Kelvin (-223° C or -370° F). Therefore, Webb has a large shield that blocks the light from the Sun and Earth (and the Moon), which otherwise would heat up the telescope, and interfere with the observations. Webb will be placed in orbit around the Sun at a special location where its sunshield can block both the Sun and Earth (and Moon) all the time. ; the second Lagrange point (L2) of the Sun-Earth system has this property. L2 is a semi-stable point in the gravitational potential around the Sun and Earth. The L2 point lies outside Earth's orbit while it is going around the Sun, keeping all three in a line at all times. The combined gravitational forces of the Sun and the Earth can almost hold a spacecraft at this point, and it takes relatively little fuel to keep the spacecraft near L2. The cold and stable temperature environment of the L2 point will allow Webb to make the very sensitive infrared observations needed. There has been a lot of progress in technology since Hubble was built. The best example of weight reduction is the primary mirror, which takes up a considerable fraction of the total observatory mass. The mirror has to be very accurately shaped. Any variations from the perfect shape of the mirror have to be less than a fraction of the observing wavelengths, which start at about 0.1 micrometer (in the ultraviolet) for Hubble and 0.6 micrometer (gold light) for Webb. (For comparison, the average thickness of a human hair is about 100 micrometers.) To keep the mirror in such a perfect shape, Hubble has a thick, solid glass mirror with a mass around 1000 kg (2200 lbs on Earth). Webb's mirror will consist of 18 thin, lightweight beryllium mirror segments, which will be kept in the right shape and place by a large number of adjustors attached to a stiff backing frame. Including the backing frame, the 18 segments of the Webb primary mirror total about 625 kg (1375 lb on Earth). These kinds of technologies, which were not available at the time Hubble was built, will be used throughout Webb. Here is a pictoral comparison of the Hubble and Webb mirrors. Beryllium (atomic symbol: Be) is a gray, brittle metal with an atomic number of 4. Beryllium has a high strength per unit weight. It tarnishes only slightly in air. The addition of beryllium to some alloys often results in products that have high heat resistance, improved corrosion resistance, greater hardness, greater insulating properties, and better casting qualities. Many parts of supersonic aircraft are made of beryllium alloys because of their lightness, stiffness, and dimensional stability. Other applications make use of the nonmagnetic and nonsparking qualities of beryllium and the ability of the metal to conduct electricity. Beryllium is toxic and no attempts should be made to work with it before becoming familiar with proper safeguards. The specific advantages to Webb are beryllium's light weight, stiffness and its stability at very cold temperatures. Webb is not protected from the violent forces experienced during launch, so we have to build the telescope to survive launch. This is a key element of the design work that goes into building the telescope. We have already constructed an engineering test mirror and demonstrated it can survive launch with no measurable degradations. Individual elements of the telescope are shaken with simulated launch forces to ensure that they can survive launch. After putting together the integrated telescope package, we will subject that to vibration testing as well. In regards to the beryllium primary mirror, the issue of launch forces was a consideration during selection of the material. The main concern with beryllium mirrors is that they might change their shape very slightly during launch and so we conducted a technology demonstration (involving a beryllium mirror shake test) to show that the mirror will not experience any change in shape during launch. The Webb mirror is made from a top grade of beryllium with extensive heritage in space systems. Concerns about beryllium mirrors being brittle are mainly an issue when the mirrors are machined. Glass can also be pretty fragile but it is widely used in flight mirrors so how you design, handle and support the mirrors is what matters most. We tested beryllium discs for micrometeoroids using test facilities in the US and showed the micrometeoroids have negligible effects on the beryllium. Cryogenic beryllium mirrors have been flown in space exposed to micrometeoroids without problems. The Spitzer Space Telescope, launched in 2003, has a beryllium primary mirror. All of Webb's systems are designed to survive micrometeoroid impacts. Webb's mirrors are coated with gold to optimize them for infrared light. Why does gold reflect red radiation well? Here's a scientific explanation. First, metals reflect light because they are good conductors of electricity. Electrons are widely-shared among the atoms in metals such that they form kind of a "gas" of electrons that respond very quickly to changes. It's really hard to set up an electric field in a conductor (metal) because the electrons are free to move to make it and keep it zero. Light is an electro-magnetic wave, and when it hits metal, it induces oscillations in the electrons near the surface. The electrons move to try to make the net electric field in the metal zero, so the combination of the electric field of the moving electrons and the electric field of the light adds up to zero in the metal by the light being re-emitted or bounced away in an opposite direction. Maxwell's equations can be used to explain this. Second, each element has a unique atomic structure and a different way its electrons are "arranged" and so each responds uniquely as to how well light interacts with it light and reflects it, and it varies with the wavelength of the light. Gold just happens to reflect blue light very poorly but red and infrared light extremely well. This is why it looks the color that it does to our eyes (gold colored - it reflects red light much better than blue light). The gold is over-coated with a thin layer of amorphous SiO2 - i.e., glass - that protects the gold. Webb needs to have an unfolding mirror because the mirror is so large that it otherwise cannot fit in the launch shroud of currently available rockets. The mirror has to be large in order to see the faint light from the first star-forming regions and to see very small details at infrared wavelengths. Designing, building and operating a mirror that unfolds is one of the major technological developments of Webb. Unfolding mirrors will be necessary for future missions requiring even larger mirrors, and will find application in other scientific, civil and military space missions. Webb's angular resolution, or sharpness of vision, will be the same as Hubble's, but in the near infrared. This means that Webb images will appear just as sharp as Hubble's do. Webb will have an angular resolution of somewhat better than 0.1 arc-seconds at a wavelength of 2 micrometers (one degree = 60 arc-minutes = 3600 arc-seconds). Seeing at a resolution of 0.1 arc-second means that Webb could see details the size of a US penny at a distance of about 24 miles (40 km), or a regulation soccer ball at a distance of 340 miles (550 km). With some infrared capability, Hubble is capturing gorgeous images, like this one of the Horsehead Nebula. Webb is optimized to see deeper into the infrared than Hubble, and has a much larger mirror, as well as state of the art detectors. Its imagery will be detailed and spectacular. This feature explains how Hubble images are created; Hubble's detectors actually produce images in shades of black and white - color is added during image processing. The colors aren't always what we'd see if we were able to visit the imaged objects in a spacecraft. Color is a tool, which can enhance an object's detail or visualize what could never been seen by the human eye. Webb image processing will be similar. Webb will have two types of detector arrays (SCA): visible to near-infrared arrays with 2,048 x 2,048 pixels, and mid-infrared arrays with about 1,024 x 1,024 pixels. Several detectors will be built into mosaics to give a larger field of view. NIRCam, NIRSpec and FGS-NIRISS will use Mercury Cadmium Telluride (HgCdTe) detectors made by Teledyne Scientific & Imaging. MIRI will employ arsenic doped silicon (Si:As) detectors produced by Raytheon. The large sunshade will protect the telescope from heating by direct sunlight, allowing it to cool down to a temperature below 50 Kelvin (-223° C or -370° F) by passively radiating its heat into space. The definition of the Kelvin temperature scale is that 0 K is "absolute zero," the lowest possible temperature. Water freezes at 32 degree F, 0 degree C or about 273 K. The near-infrared instruments (NIRCam, NIRSpec, FGS/NIRISS) will work at about 39 K (-234° C or -389° F) through a passive cooling system. The mid-infrared instrument (MIRI) will work at a temperature of 7 K (-266° C or -447° F), using a helium refrigerator, or cryocooler system. The primary goals of Webb are to study galaxy, star and planet formation in the Universe. To see the very first stars and galaxies form in the early Universe, we have to look deep into space to look back in time (because it takes light time to travel from there to here, the farther out we look, the further we look back in time). The Universe is expanding, and therefore the farther we look, the faster objects are moving away from us, redshifting the light. Redshift means that light that is emitted as ultraviolet or visible light is shifted more and more to redder wavelengths, into the near- and mid-infrared part of the light spectrum for very high redshifts. Therefore, to study the earliest star formation in the Universe, we have to observe infrared light and use a telescope and instruments optimized for this light. Star and planet formation in the local Universe takes place in the centers of dense, dusty clouds, obscured from our eyes at normal visible wavelengths. Near-infrared light, with its longer wavelength, is less hindered by the small dust particles, allowing near-infrared light to escape from the dust clouds. By observing the emitted near-infrared light we can penetrate the dust and see the processes leading to star and planet formation. Objects of about Earth's temperature emit most of their radiation at mid-infrared wavelengths. These temperatures are also found in dusty regions forming stars and planets, so with mid-infrared radiation we can see the glow of the star and planet formation taking place. An infrared-optimized telescope allows us to penetrate dust clouds to see the birthplaces of stars and planets. The reflective surface on Webb's mirrors is gold. Although gold absorbs blue light, it reflects yellow and red visible light, and Webb's cameras will detect that visible light. Webb will work from 0.6 to 28 micrometers, ranging from visible gold-colored light through the invisible mid-infrared. The short wavelength end is set by the gold coating on the primary mirror. The long wavelength cut-off is set by the sensitivity of the detectors in the Mid-Infrared Instrument. Webb is designed to discover and study the first stars and galaxies that formed in the early Universe. To see these faint objects, it must be able to detect things that are ten billion times as faint as the faintest stars visible without a telescope. This is 10 to 100 times fainter than Hubble can see. Search for the first galaxies or luminous objects that formed after the Big Bang. Determine how galaxies evolved from their formation until the present. Observe the formation of stars from the first stages to the formation of planetary systems. Measure the physical and chemical properties of planetary systems and investigate the potential for life in those systems. One of the main goals of Webb is to detect some of the very first star formation in the Universe. This is thought to happen somewhere between redshift 15 and 30 (redshift explained in question 45). At those redshifts, the Universe was only one or two percent of its current age. The Universe is now 13.7 billion years old, and these redshifts correspond to 100 to 250 million years after the Big Bang. The light from the first galaxies has traveled for about 13.5 billion years, over a distance of 13.5 billion light-years. The Webb will be able to detect the presence of planetary systems around nearby stars from their infrared light (heat). It will be able to see directly the reflected light of large planets - the size of Jupiter - orbiting around nearby stars. It will also be possible to see very young planets in formation, while they are still hot. Webb will have coronagraphic capability, which blocks out the light of the parent star of the planets. This is needed, as the parent star will be millions of times brighter than the planets orbiting it. Webb will not have the resolution to see any details on the planets; it will only be able to detect a faint light speckle next to the bright parent star. Webb will also study planets that transit across their parent star. When the planet goes between the star and Webb, the total brightness will drop slightly. The amount that the brightness drops tells us the size of the planet. Webb can even see starlight that passes through the planet's atmosphere, measure its constituent gasses and determine whether the planet has liquid water on its surface. When the planet passes behind the star, the total brightness drops, and we can again determine more of the planet's characteristics. Yes. Webb can observe everything in our Solar System that is further from the Sun than the Earth is. Webb's sensitivity will be most useful in studying the faint rocky and icy objects in the far outer Solar System, including the dwarf planet Pluto and other Kuiper Belt Objects. Webb's studies of these objects will test theories of how the Solar System formed. Webb will also observe the moons of the gas giant planets, comets and asteroids and the planets Mars, Jupiter, Saturn, Uranus and Neptune. The first targets for Webb will be determined through a process similar to that used for the Hubble Space Telescope and will involve NASA, ESA, CSA and scientific community participants. The first engineering target will come before the first science target and will be used to align the mirror segments and focus the telescope. That will probably be a relatively bright star or possibly a star field. Webb cannot directly see "dark matter," the unseen matter that makes up a large fraction of the mass of galaxies and clusters of galaxies, but Webb can measure its effects. One of the best ways to measure mass is through the gravitational lens effect. As described by Einstein's General Relativity theory, a light beam passing near a large mass will be slightly deflected, because space-time is disturbed by the presence of mass. By taking pictures of distant galaxies behind nearby galaxies, astronomers can calculate the total amount of mass in the foreground galaxies by measuring the disturbances in the background galaxies. Because astronomers can see how much mass is present in stars in the foreground galaxies, they can then calculate how much of the total mass is missing, which is presumed to be in the dark matter. Webb will be particularly well-suited for this type of measurement, because its very sharp images will allow very small disturbances to be measured, and because it can see so deep into space, giving it access to many more background galaxies to measure disturbances caused by this gravitational lensing effect. Also, Webb will observe many statistics of galaxy evolution and scientists can compare these observations to theories of the role that dark matter played in that process, leading to some understanding of the amount and nature of the dark matter in galaxies. In 1998, observations of distant supernovae revealed that about 70% of the universe consists of mysterious dark energy which is pushing on the expansion of the universe and causing it to accelerate. Previously, astronomers thought that the expansion would decelerate due to the gravity of the dark matter. In 2003, observations of the cosmic microwave background confirmed this discovery. The 2011 Nobel Prize in Physics was awarded to Adam Riess, Brian Schmidt and Saul Perlmutter for the discovery of dark energy. The Hubble Space Telescope has also contributed to dark energy research. At about half the current age of the universe, the expansion rate, which had been decelerating, changed to acceleration as the dark energy overcame the effects of the dark matter. The deceleration in the early universe was first seen by Hubble, which confirmed that dark energy is the best explanation for the supernova results, rather than a change or evolution in the supernova themselves. As a successor to Webb, NASA is planning a Wide-Field Infrared Survey Telescope (WFIRST), a space observatory designed to settle essential questions in both exoplanet and dark energy research, and which will advance topics ranging from galaxy evolution to the study of objects within our own galaxy. WFIRST will be a wide-field-of-view near-infrared space telescope that will observe hundreds or thousands of supernova and millions of galaxies. It will make the subtle statistical measurements that reveal the properties of the dark energy and could find out what the eventual future fate of the universe: collapsing into a big crunch or expanding forever in a big rip. In contrast, Webb will observe fewer supernovae, but by observing them at higher redshift, fainter levels and further into the infrared, it will provide complementary information to WFIRST. The concept of the Big Bang is both simple and easy to misunderstand. View this Q&A for answers to some commonly asked questions about the Big Bang, and about Webb's role in understanding the early history of the universe. The Mid-Infrared Instrument (MIRI) is provided by a consortium of European countries and the European Space Agency (ESA) and the NASA Jet Propulsion Laboratory (JPL) with detectors from Raytheon Vision Systems. The Near-Infrared Spectrograph (NIRSpec) is provided by ESA. The Near-Infrared Camera (NIRCam) is built by the University of Arizona working with Lockheed-Martin. The Near-Infrared Imager and Slitless Spectrograph (NIRISS) are provided by the Canadian Space Agency (CSA). All of the near-infrared detectors are supplied by Teledyne Technologies, Inc. The launch vehicle and launch services are provided by ESA. The Science and Operations Center will be at the Space Telescope Science Institute (STScI). The Webb project has partners or contractors in 27 states and the District of Columbia. In addition, in a program with the Girl Scouts of the USA, Webb has Education and Public Outreach activities in 41 states, the District of Columbia, Guam and a US Air Force Base in Japan. Fourteen countries are involved in building the James Webb Space Telescope: Austria, Belgium, Canada, Denmark, France, Germany, Ireland, Italy, the Netherlands, Spain, Sweden, Switzerland, the United Kingdom and the United States of America. The launch of Webb will take place in French Guiana, an overseas department of France located in South America. Webb will be a General Observatory, meaning that competitively selected proposals from around the world will be used to develop the observing plans. These proposals will be judged by a peer review system, in which teams of independent scientists will rank the observing proposals according to scientific merit, and the highest ranked proposals will be selected. The results of these studies will be published in scientific journals, and the data will be made available through the Internet to other scientists and the general public for further studies. This is the same system that is used to schedule the Hubble Space Telescope and many other space and ground-based observatories. The public has access to many of the beautiful images of the sky that Hubble has taken through the HubbleSite website, which is maintained by the Space Telescope Science Institute (STScI). The images in the gallery and the scientific results are also packaged into products for use by museums and by teachers. Hubble's scientific discoveries are explained in press releases. Webb images and discoveries will be made available to the public, to teachers and to the press in the same way, and the same Outreach team at the STScI will begin supporting Webb in addition to Hubble after launch. Yes! For a more detailed answer, see this question in our FAQ. Webb will launch from Arianespace's ELA-3 complex at the European Spaceport located near Kourou, French Guiana, in South America. Webb will not launch from NASA's Kennedy Space Center in Florida. The launch site in Kourou, the launch vehicle, and the Ariane 5 rocket are a part of the European Space Agency (ESA) contribution to the mission. Since the launch site is not NASA's, and also due its remote location, NASA is unable to offer public viewing on-site. Current theories of galaxy formation suggest that the birth process for these vast systems of stars may be very violent events, and will be billions of times brighter than our Sun. Such events may remain visible at highly redshifted wavelengths. That is, although much of the energy produced is emitted in the ultraviolet, it will be redshifted into the infrared by the time it gets to us because of the extreme distance (in space and time) from the present. Redshift is a special astronomical case of a physical phenomenon called the Doppler effect (after Christian Doppler [1803-1853]). The Doppler effect occurs when a source sending out waves (either sound or light) is moving with respect to an observer. When the source is moving toward the observer, waves arrive earlier than they would in the stationary case and the wave peaks arrive closer together (the sound is higher pitch or the light is bluer). If the source is moving away from the observer, the waves get more stretched out (the sound is lower pitch or the light is redder). The Doppler effect on sound can be clearly heard when a siren or fast train is passing by. In astronomy, most galaxies are moving away from us because the Universe is expanding, so the light from the galaxies is redshifted. The farther the galaxy is away from us, the faster it is moving, and the larger the redshift. How redshift is connected to the distance of an object depends on the expansion rate of the Universe, the geometry of the Universe and the energy content of the Universe (slowing down or accelerating the expansion). Determining these values is an important subject of investigation of current-day astronomy. Redshifts are measured by taking spectra of the electromagnetic radiation (X-rays, ultra-violet, visible and infrared light, microwaves, radio waves, etc.) of astronomical objects. Physical processes within the atoms and molecules that make up stars and galaxies cause the spectra to have certain recognizable features at very specific wavelengths. The wavelengths of these atomic and molecular absorption or emission lines can be measured very accurately. By measuring the observed wavelength of a feature in the spectrum of a galaxy, and comparing it to the known emitted wavelength, astronomers can measure the Doppler shift of the galaxy. Galaxies are said to have a redshift of 1 if their spectral features have shifted to twice as long a wavelength. If their features have shifted to 3 times longer wavelength they have redshift 2, and so on. Webb is designed to see galaxies at redshifts of 15 or more, where the ultraviolet light is redshifted into the infrared. A light-year is the distance traveled by light in one year, about 5,880,000,000,000 miles (9,460,000,000,000 kilometers). Since it takes light as long to travel from there to here as the distance in light-years, we can say that when we look at an object that is a million light-years away, we see it now here as it was a million years ago there. Looking deep into space is looking far back into time. Astronomers generally use the unit "parsec" to measure distances. One parsec is equal to about 3.26 light-years. Distances between galaxies are measured in Megaparsecs (Mpc), or millions of parsecs. A micrometer, also called a micron, is a millionth of a meter, or a thousandth of a millimeter. As a reference, the diameter of a human hair is about 100 micrometers. Wavelengths of infrared radiation are typically expressed in micrometers. A thousandth of a micrometer is called a nanometer. Arc-seconds and arc-minutes are used to measure very small angles. An arc-minute is 1/60 of a degree, and an arc-second is 1/60 of an arc-minute, or 1/3600 of a degree. Infrared radiation is one of the many types of 'light' that comprise the electromagnetic spectrum. Infrared light is characterized by wavelengths that are longer than visible light (400-700 nanometers, or 0.4-0.7 micrometers; also denoted as microns). Astronomers generally divide the infrared portion of the electromagnetic spectrum into three regions: near-infrared (0.7-5 micrometers), mid-infrared (5-30 micrometers) and far infrared (30-1000 micrometers). Webb will be sensitive to near-infrared and mid-infrared radiation. Much of the information we have from the universe comes from light. Sunlight (and starlight) is made up of many different colors. We can see this by holding a prism up to the sunlight. The prism separates the light into the individual colors of the rainbow - the visible light spectrum. Yet the light we can see represents only a very small portion of the electromagnetic spectrum. Just beyond the violet light is light with an even shorter wavelength called "ultraviolet", and beyond that X-ray light and gamma rays, with wavelengths millions of times shorter than those of visible light. Likewise, just beyond the red is light we call "infrared," and beyond that microwaves and radio waves having wavelengths millions of times longer than those of visible light. The wavelength is directly related to the amount of energy the waves carry per photon. A photon is a fundamental particle of electromagnetic energy. The shorter the radiation's wavelength, the higher is the energy of each photon. Although the photon energy carried by each wavelength differs, all forms of electromagnetic radiation travel at the speed of light - about 186,000 miles (300,000 km) per second in a vacuum. Only certain parts of the electromagnetic spectrum (all light ranging from gamma ray to radio waves) can make it to the Earth's surface. Our atmosphere absorbs much of this light. Visible light, radio waves and a few small ranges of infrared wavelengths do make it through. Gamma rays, X-rays and most of the ultraviolet rays and infrared rays do not. This is why infrared telescopes are placed on high, dry mountains (like Mauna Kea in Hawaii) so that they can observe more infrared radiation. The only way to study the entire range of infrared (as well as gamma ray, x-rays, ultra-violet) is to place telescopes in space well above the atmosphere. Only some (not all) of the infrared radiation between 1 and 40 micrometers makes it to the Earth's surface. Water vapor in our atmosphere absorbs most of the rest. Infrared radiation is also absorbed to a lesser degree by carbon dioxide, ozone, and oxygen molecules. Browse the various pages on our website to find out more about the James Webb Space Telescope. See also the website maintained by the Space Telescope Science Institute. The science goals and planned implementation of the observatory were published by Gardner et al. 2006, Space Science Reviews, 123/4, 485-606, available by clicking here. Learn about recent progress by signing up for our email newsletter, by looking through our website, or by attending the Webb town hall at the winter meetings of the American Astronomical Society. You can also find a more technical FAQ here.